All of you are welcome toWWW.BESTOFBESTDREAM11.COM. 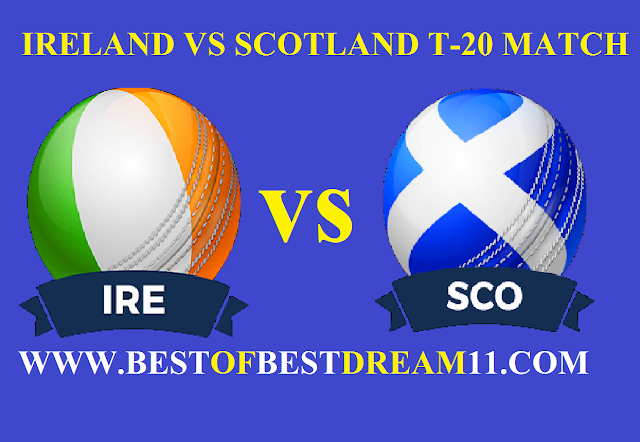 for IRE VS SCO T-20 MATCH Dream 11 team. Here is best " IRE VS SCO " T-20 match dream 11 team for the fantasy user whovenue are looking to make a strong team for maximum win. We are providing latest news, match update, information about the match. The team is picked by using various factors on the basis of performance .ground stats and latest form. 1- IRELAND defeated SCOTLAND in last T-20 match . SCO team could only manage 159 run. 2- P. Stirling(51),Gary wilson(58) and Andrew Balbirine (74) played a good inning for Ireland. 3-IRELAND'S team would like to win this match, this will be his last match in the league. 4-H Munsey and K Koetzer had performed well on behalf of Scotland. 5- Scotland might bring in S Sharif back in playing xi. 6-w Poterfield is doubtful in this game.